Weaving, painting, sculpture, pottery, photography, embroidery, macrame, etc. is it art or craft? These are two forms of creativity that are commonly juxtaposed by the people, as they don’t see any difference in them. But the fact is that art is different from the craft in a sense that art is a creative merit that comes from within. On the contrary, the craft is skilled work, wherein there is an application of technique, that people learn through much practice. Next, art emerges from the heart, whereas craft comes from the mind. 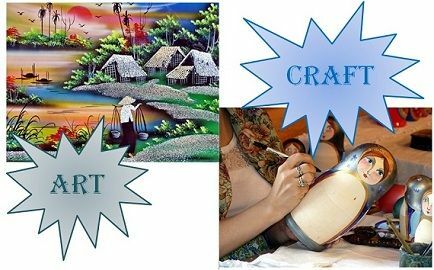 Here, in the given article, you may find all the important differences between art and craft, so have a glance. Meaning An unstructured and boundless form of work, that expresses emotions, feelings and vision is called art. Craft refers to an activity, which involves creation of tangible objects with the use of hands and brain. Emphasizes Ideas, feelings and visual qualities. Right use of tools and materials. We define the term ‘art’ is an expression and application of imagination, feelings, thoughts, ideas or any other human creativity, in a visual form, having aesthetic and emotional value. It includes painting, sculpture, drawing, photography, architecture, etc. It is an open-ended, unstructured form of work; that cannot be reproducible. ‘Monalisa,’ the famous painting, made by Leonardo DA Vinci is a great example of it. A piece of art has an intended meaning that provokes a person’s feelings. It has a limitless expression and endless interpretation, which depends on the person. The term ‘craft’ implies an activity involving skill and experience in the creation handmade tangible objects that fulfil a particular purpose. It is defined as the production of those objects that has utility for people. The purpose can be decorative or functional or both, depending on the use. Craft is a product of the mind; that attracts people. It is a learned ability, which is acquired by a person through regular practice. It includes things made of hands like bird houses, mats, woven basket, embroidery, blankets, handbags, candles, jewellery, pottery, glass work and so on. Art is described as an unstructured and open-ended form of work; that expresses emotions, feelings, and vision. Craft denotes a form of work, involving the creation of physical objects, by the use of hands and brain. Art relies on artistic merit whereas craft is based on learned skills and technique. Art is well known for serving an aesthetic purpose. On the other hand, craft serves human objectives. Art gives particular attention to ideas, feelings and visual qualities. Conversely, craft gives stress on the right use of tools and materials, and the application of technique. There is a flow of emotion in art, which emerges from heart and soul. In contrast, the craft is the product of the mind. Craft can be quantified easily which is not in the case of craft. The duplicability of art forms is not possible while craft forms can easily be copied. Art is the consequence of an individual’s innate ability. On the contrary, craft is the result of learned ability and experience. To sum up this article, we can say that art is something that expresses emotions or imagination. The craft has a tangible form (like moulding, carving, etc.). It is the creation of goods of a utilitarian nature, to serve a human purpose. Art appeals to the mind and makes the connection emotionally, whereas craft only attracts people.